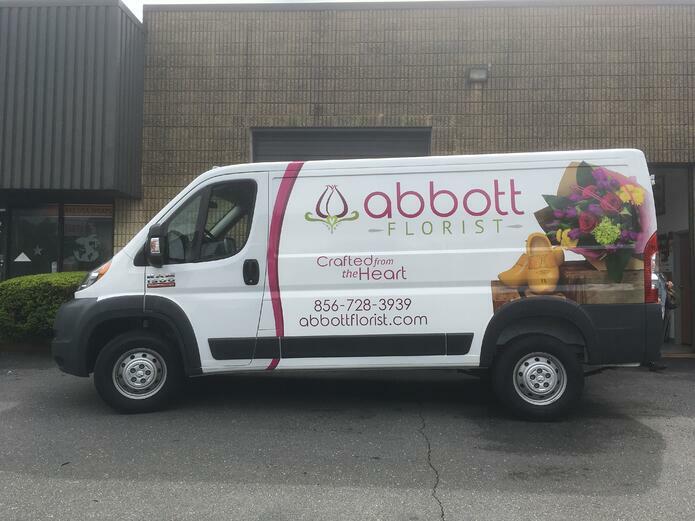 Abbott florist is a family owned and operated florist located in Turnersville, NJ. They offer a wide variety of floral and decorative services, including fresh flowers, silk arrangements, funeral designs, wedding services, gift baskets, dish gardens, and much more. Besides their storefront in Turnersville, they also offer delivery services homes and businesses in the South Jersey area as well. 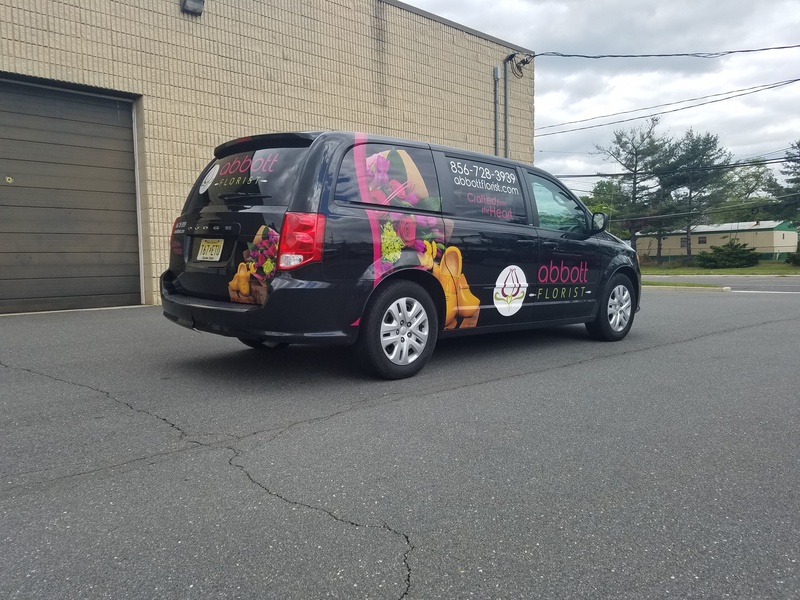 It was these delivery services that prompted Abbott to contact our team here at Sunrise Signs about partial fleet vehicle wraps. 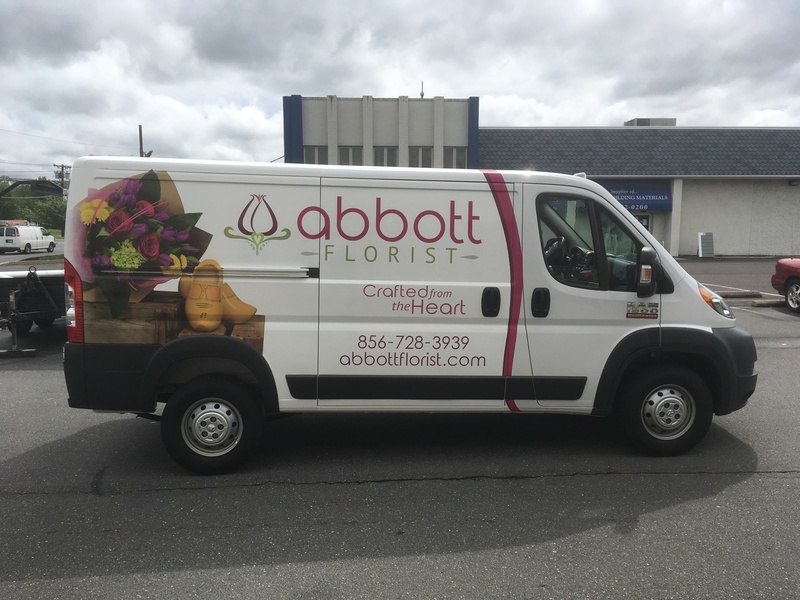 Abbott Florist’s owner, Jackie, had two delivery vehicles that were out of the road without any kind of branding, short of a small decal on the front doors. 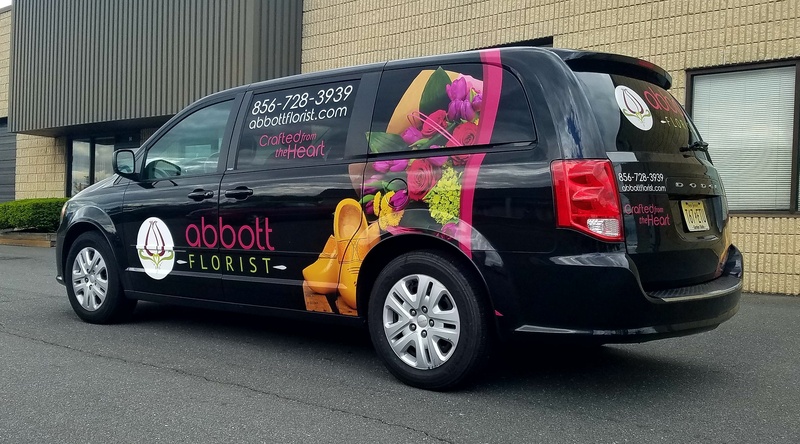 Having recently updated her branding and logo, Jackie knew she wanted to do more than just a simple graphic when it came to updating her vehicle's look. She contacted us here at Sunrise Signs and the rest is history! During our initial branding consultation with Jackie, we extrapolated several important elements to help created a unique and personal wrap design. Besides bright floral arrangements and her new logo, Jackie also wanted to incorporate an element of her Dutch heritage, all while keeping the wrap design looking clean and professional. We decided to showcase a professional photograph Jackie had taken of a floral arrangement, including a pair of wooden shoes that carried sentimental value to her as well. 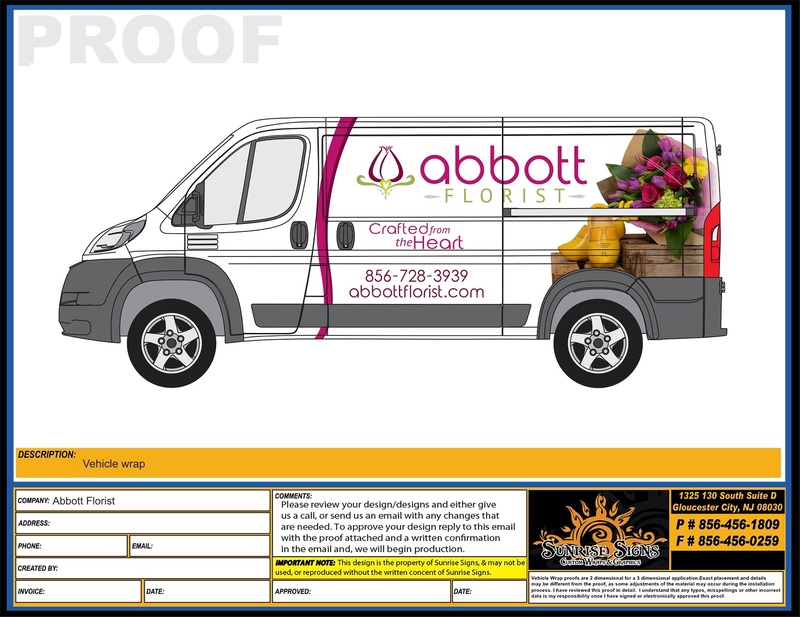 The Abbott delivery fleet consists of two vehicles: a Ram Promaster and Dodge Caravan, one white, one black. Given the different body styles and base colors of the vehicles, we recommend a different approach for each. For the Ram Promaster we produced a ¾ partial vehicle wrap to keep all her brand elements clean and portioned off on the vehicle sides. We color matched the “swoosh” line to her logo, and keep the information on the side clean, simple, and easy to read. We then added in the high-resolution photo of the flowers and shows to add some visual “pop” to the layout. On the rear we used the same elements, resized to properly fit within the constraints of the vehicle body. 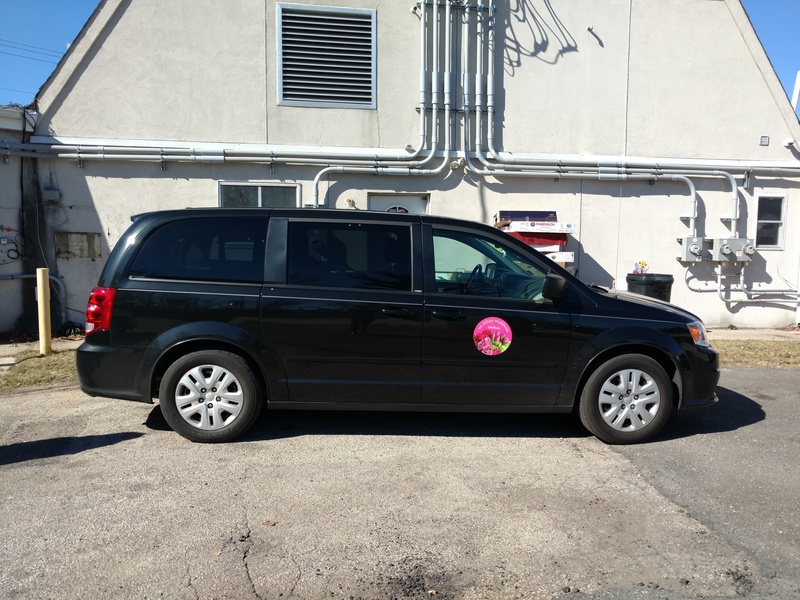 On the Dodge Caravan we recommend using a mixture of cut and spot vehicle graphics. This helped us keep the project within budget, while still allowing us to incorporate all her brand elements and keep the fleet consistent. Slight modifications were made to the layout to work around the body lines The bright colors of her name contrasted well against the dark paint on the vehicle, so we didn’t need to add an additional stroke around the cut text. When everything was finished up, we had two sharp looking fleet delivery vehicles and one very satisfied customer! Have delivery vehicles of your own that could look better? 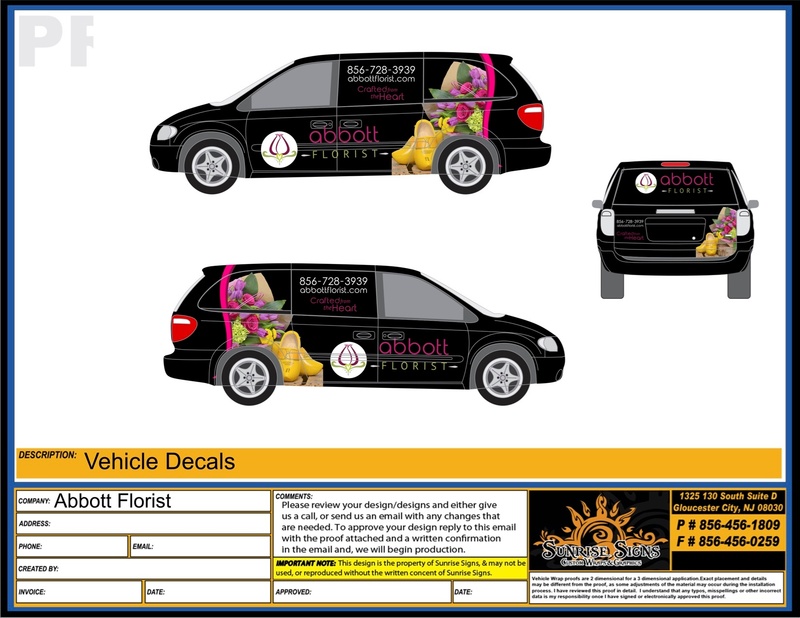 Have questions about vehicle wraps and graphics? Give us a call today and we’ll start a conversation!